A podcast that takes intimate interviews with First Nations artists and leaders to the world. 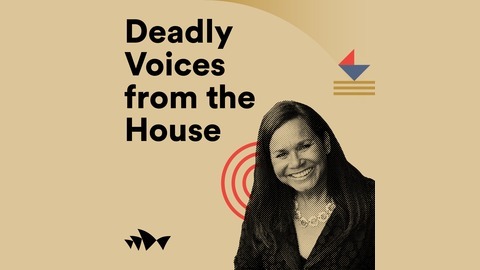 Acclaimed presenter, journalist, actor, producer and arts guru Rhoda Roberts AO returns to our airwaves to present Deadly Voices from the House, recorded live from Sydney Opera House. Featuring a diverse selection of guest appearances from prominent First Nations leaders from the music, arts and culture sector. Deadly Voices from the House provides an important platform to discuss critical issues and explore the vibrancy and diversity of contemporary culture. 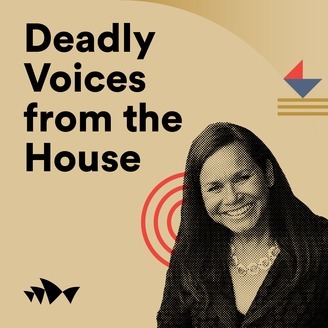 Deadly Voices from the House is supported by Sydney Opera House Presents, the Community Broadcasting Association of Australia and the National Indigenous Radio Service. As part of our Badu Gili series, Rhoda Roberts chats with Patricia Ansell Dodds and Mervyn Rubuntja about their selected artworks. Patricia has been painting for 14 years and has earned a Bachelor of Arts as well as a Associate Diploma in Business Management and Certificate One Tourism. She has lectured in Art, Aboriginal Cross Culture Courses at IAD as well as Aboriginal Cross Culture, History of Central Australia at Remote Health in Alice Springs for Flinders University. Her art has featured in logos for Nationals meetings in Alice Springs. Her art contributed to Alice Springs claiming the title of Territory Tidy town in 2007 as it decorated 30 bins for the local town council. Mervyn was born at the Telegraph Station in Alice Springs. Mervyn has followed in his father’s footsteps painting in the watercolour style that his father taught him. When Mervyn was 13 years old his family moved to Hermannsburg this is where he first saw watercolour paintings as he watched his uncles Maurice, Oscar and Keith Namatjira painting like their father Albert. Arnulf Ebatarinja another uncle kindled Mervyn’s painting talent when he gave him some watercolour paperboard and taught him to paint.